Our Beginners Pilates classes are designed to follow a progressive eight week course, which allows you to gradually get to grips with the basic exercises and breathing techniques. The classes are accompanied by a home exercise booklet following the class exercises. Is Beginners Pilates for me? Beginners classes are suitable for those who have little or no previous Pilates experience. The class focuses on technique, isolation and correct activation of muscle groups, but it is still a workout. Beginners classes are suitable for you if you have back pain, a musculoskeletal injury or health condition you wish to return to an active healthy lifestyle. You will be closely monitored by our Pilates instructors, all of whom are physiotherapists. This allows them to tailor the exercises to your needs, and adjust any exercises which you may have difficulty with. The classes are mat based and will focus on the key principles of Pilates and will help develop your strength, tone, flexibility and improve your posture. A basic level of fitness is helpful but not essential. You will be introduced to small Pilates equipment throughout the block, which adds variety to the classes and exercises. You will receive a supplementary booklet with the class following the 8-week programme to allow you to continue your practice at home. All equipment is provided. Dress as you would for a fitness class, we do the class in bare feet or socks. Bring a bottle of water to keep hydrated! Please note on your first class, we ask that you arrive at least 10 minutes early. This is to allow you enough time to discuss any issues with the instructor and also complete a quick assessment. Prior to commencing the class you will be asked to fill in a medical screening form (this is standard procedure for all participants). Our All Levels classes are suitable for all abilities, including complete beginners (with a degree of background fitness). Your instructor will offer options within the class, allowing you to work at your own level. If you are looking for a step up to the next level from beginners, then this is the class for you. Is All Levels Pilates for me? All Levels classes are ideal for maintenance of health, prevention of musculoskeletal pain and can also help rehabilitate after injury. You will be closely monitored by our Pilates instructors, all of whom are physiotherapists. This allows them to tailor the exercises to your needs, and adjust any exercises which you are having difficulty with. The classes are mat based and will focus on developing the key principles of Pilates and will help develop your strength, tone, flexibility and improve your posture. Expect more variety than a beginners course, working through different levels of exercises but there are always modifications and options available. Small equipment will be used within the class, allowing the instructor to add variety to the class, and increase the difficulty of the exercises. Prior to starting the class you will be asked to fill in a medical screening form (this is standard procedure for all participants). All equipment is provided. Dress as you would for a fitness class, we do the class in bare feet or socks. Bring a bottle of water to keep hydrated! If you are looking for a dynamic, fun and challenging Pilates workout these are the classes for you – not for the faint-hearted! The intermediate/advanced classes are designed for those who are confident with the foundations of Pilates and are able to execute the exercises with expert control. The classes are designed to be highly functional, high paced and intense. The focus is on further developing your overall strength and endurance for the more experienced Pilates goer. Is Intermediate/Advanced Pilates for me? Designed by our physiotherapists, the classes are for those individuals who are both active and athletic, functioning at a high level but are also looking for maintenance of health and well-being as well as prevention of injury. Advanced Pilates can be complementary to other high-loading sports e.g. running. You need to be proficient with Pilates and be ready to push yourself harder and further. You’ll need good levels of fitness, stamina, flexibility, core strength and technical capability. (Please ask your instructor if you’re not sure about this class). The classes are mat based but there is a large focus on using body weight for strength as well as small hand weights. There is a highly functional component to the class and expect to get sweaty as there will be some cardio/interval training in the class! Prior to commencing the class you will be asked to fill in a medical screening form (this is standard procedure for all participants). All equipment is provided. Dress as you would for a fitness class, we do the class in bare feet or socks. Bring a bottle of water to keep hydrated and perhaps a towel! As expectant mothers know, your body experiences a huge amount of change whilst pregnant. Current evidence suggests that a moderate intensity exercise is important during your pregnancy for prevention of many health issues (www.rcog.org.uk). Our Physiotherapy led Antenatal classes are a great way to help with changes occurring in pregnancy and suitable for expectant mothers at any stage of pregnancy (6-42 weeks). In addition to the fitness and health benefits of exercise during pregnancy our physiotherapists have had specialised training in antenatal care specifically looking at prevention of pregnancy related pelvic girdle pain and other musculoskeletal issues. You can feel happy that the exercises given are safe for both baby and mother. Antenatal classes are a great way to meet like-minded Mummys to be too! 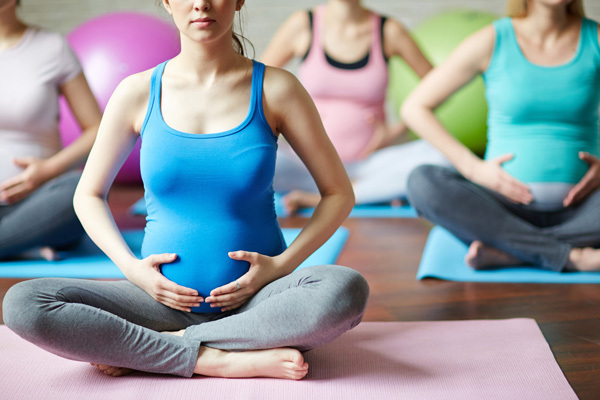 Is Antenatal Pilates for me? The aims of the class are to help you appropriately maintain the strength of your core and pelvic floor from first trimester to full-term pregnancy, incorporating the key principles of Pilates. Improved strength and endurance can help with the demands of childbirth, specifically reducing your risk of low back and other musculoskeletal complications. The exercises will be adapted to your stage of pregnancy, allowing you to exercise safely throughout your pregnancy. We can also adapt exercises for pre-existing complaints/conditions. It is advisable to start the classes as soon as you can – 1st trimester into beginning of 2nd trimester. The classes are mat based, less intense than your standard class but varied and specific to the needs of pregnancy. We encourage a lot of pelvic stability work in standing and adapt mat exercises into high kneeling and seated. A basic level of fitness is required. You will be closely monitored by our Pilates instructors, all of whom are physiotherapists. This allows them to tailor the exercises to your needs, and adjust any exercises which you are having difficulty with. You will receive a supplementary booklet with the class following the 8-week programme for exercises at home. All equipment is provided. Dress as you would for a fitness class, we do the class in bare feet or socks. Bring a bottle of water to keep hydrated! We request you bring two cushions from home to assist with supine work (from 12 weeks+ of your pregnancy). We will ask you to bring a gym ball along to class on week 7 for the gym ball class. Please note on your first class, your instructor will complete a quick assessment, you may be asked to arrive a little early or stay behind for this to happen. Prior to entering the class you will be asked to fill in a medical screening form (this is standard procedure for all participants). Our postnatal classes are designed specifically with mums in mind. Whether you are looking to get back into exercise or feel like you need some postnatal rehabilitation this is the class for you. You can begin classes as early as 6 weeks (post GP check). The classes will help your body adapt to the postural demands of having a baby, while at the same time you gain pelvic floor control and abdominal strength in a safe and graded environment. Physiotherapists have had additional expert training in postnatal rehabilitation (including diastasis recti separation, pelvic floor muscle control and pelvic girdle stability) and have designed the classes to focus on recovery from the demands of pregnancy and childbirth. They will help you regain your pre-pregnancy figure, and help you prepare for life with a little one. Is Postnatal Pilates for me? The aims of the class are to help you regain the strength of your core and pelvic floor from the initial postnatal stages to getting you ready/fit for exercise again. The exercises are progressive over 8-weeks, we can also adapt exercises for pre-existing complaints/conditions as well as modify and increase the difficulty for those with more experience, allowing for progressions in endurance, strength and stability. You can bring your baby along to the class. Small equipment will be used within the class, allowing the instructor to add variety to the class, and increase the difficulty of the exercises. You will receive a supplementary booklet with the class following the 8-week programme for exercises at home. The classes are mat based, varied and adapted to specific postnatal rehabilitation needs. We encourage postural and spinal alignment, deep abdominal and pelvic stability work in a variety of positions – standing, high kneeling and seated. A basic level of fitness is preferable. You will be closely monitored by our Pilates instructors, all of whom are physiotherapists. This allows them to tailor the exercises to your needs, and adjust any exercises which you are having difficulty with. Prior to commencing the class you will be asked to fill in a medical screening form (this is standard procedure for all participants). All equipment is provided. Dress as you would for a fitness class, we do the class in bare feet or socks. Bring a bottle of water to keep hydrated! Please bring a mat and some entertainment for your baby. Please note on your first class, we ask that you arrive at least 10 minutes early (or stay a few minutes behind at the end). This is to allow you enough time to discuss any issues with the instructor and also complete a quick assessment. Our 50 + classes are suitable for those over 50 years of age and cater to all abilities, including complete beginners. Your instructor will offer options within the class, allowing you to work at your own level. As the classes are physiotherapy led we are happy to modify the classes to encompass different musculoskeletal conditions e.g. Osteoarthritis, Osteoporosis, Rheumatoid Arthritis, low back pain and other joint ailments. Is Over 50’s Pilates for me? 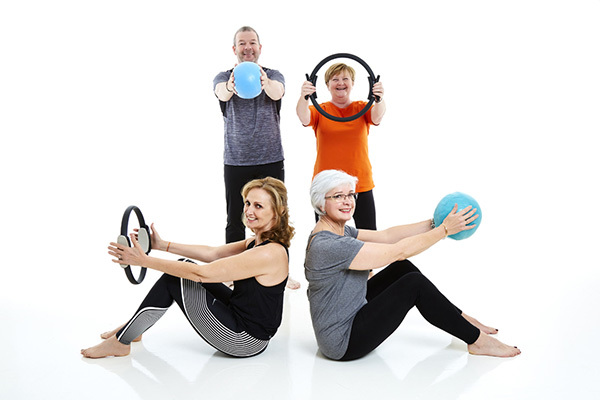 If you want a gentle form of exercise specifically working on balance, core control and at the same time increasing your endurance and fitness levels, this is the class for you. The exercises encourage increased confidence with mobility, help reduce balance issues ultimately reducing your risk of falls. You will be closely monitored by our Pilates instructors, all of whom are physiotherapists. This allows them to tailor the exercises to your needs, and adjust any exercises which you are having difficulty with. The classes are mat based but can easily be adapted to seated or standing if required and will focus on the key principles of Pilates and will help develop your strength, tone, flexibility and improve your posture. A basic level of fitness is helpful but not essential. We provide a variety of modifications for all needs. Small equipment will be used within the class, allowing the instructor to add variety to the class, and increase the difficulty of the exercises if required. Prior to commencing the class you will be asked to fill in a medical screening form (this is standard procedure for all participants). These classes are run on a rolling basis- you can start at any time and set your own schedule.